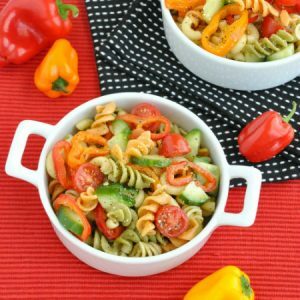 This Italian Confetti Pasta salad loaded with fresh veggies and topped with a zesty homemade Italian-style dressing. It’s potluck perfection and can easily be made ahead of time for easy peasy party prep! Hookay so… my Instagram semi-exploded the other day when I posted a photo of my pregnancy-induced pasta salad-a-thon. I think it’s a combination of everyone being giddy with excitement over spring and summer produce breaking us out of our winter rut as well as the fact that pasta is the ultimate comfort food. It holds a dear place in my heart simply because it’s so flipping versatile. I can whip up a bowl with nearly any random combination of fridge and pantry ingredients and it can be ready in a moment’s notice. This is absolutely perfect around BBQ/party/potluck season in the Spring and Summertime and, in true military mama fashion, I usually find out about most of these events a few hours before I have to attend them. It’s my speedy savior and always an instant hit. It’s also one of those dishes that, when I make it, results in a full-blown husband happy dance. I think it’s safe to say that I make this a lot. I love a good pasta salad happy dance! So I have a few plans in the works. I want to finally sit down and write up my dressing combinations for you kids. There are a LOT of them and they’re all quick, easy, and crazy delicious! Some can even be made entirely with pantry ingredients alone. I also want to write down all my favorite pasta salad combinations, since this dish can literally be made a thousand and one ways. I’m happy to do this. Not because I love you or anything (I do. Dearly.) but because I really want an excuse to eat more pasta salad. Until then, here’s my go-to recipe. This is the one I’ve been making non-stop since the temps started getting warmer outside and yes, the very same pasta salad I teased you guys with on Instagram. Sorry about that! I think I’ve confessed my love to this pasta salad three or four times in this post so far, so let’s do this once more: I LOVE THIS STUFF! I don’t typically make it in the fall or winter so the fact that it’s finally “pasta salad season” has me craving it like a madman. The Italian dressing has a higher vinegar content than most and gives the salad a real kick of flavor while the cheese compliments the zesty dressing and crunchy veggies perfectly. I hope you love it as much as I do! This Italian Confetti Pasta salad loaded with fresh veggies and topped with a zesty homemade Italian-style dressing. It's potluck perfection and can easily be made ahead of time for easy peasy party prep! To make the dressing: Whisk all ingredients together and allow to sit. Giving the dressing some time to mingle will not only infuse flavor into the oil/vinegar but also soften the dry herbs and seasoning. It should keep in your fridge for about a week, if needed. note: I use the entire batch of dresing for the pasta salad and then make a second 1/2 cup of dressing for the following day. Once the pasta has spent 24 hours marinating in the fridge it has pretty much soaked up all your yummy dressing -- adding more coats the pasta and amps up the flavor. Bring a large pot of water [about 4 to 6 quarts] to a boil. Boil noodles for around 7 minutes, stirring occasionally, for al dente pasta. To prevent sticking, feel free to add a little bit of oil to the pot. I add a spoonful of my favorite coconut oil and have to refrain from sticking my hand in the pot to eat them prematurely. After 7 minutes has passed, scoop out a noodle and test for tenderness. While your noodles are cooking, chop your veggies. I like to slice my mini peppers into rings and halve my cherry tomatoes. For the cukes, I cut the entire cucumber into quarters and then slice into little triangles. I get more veggies per forkful this way and I love the way it looks. By the time you've finished chopping your noodles should be done! Add your veggies and dressing to the mix and toss to incorporate. Dust the entire bowl with parmesan romano cheese and dig. on. in. I love the look/texture of combining some elbow macaroni with the rotini but feel free to skip it if you don't have any on hand! It's more of an add-on than a necessity. Craving a creamy dressing? Mix the above Italian dressing recipe with your favorite homemade or natural store-bought Caesar dressing. The last batch I made I added both the zest and juice of a lemon to and LOVED the refreshing twist it added to the salad. Curious? Test it out by grating a little bit of zest and adding juice to a small serving of the salad and if you love it, add it to the whole batch! Vegansaurus chefs: skip the cheesy topping and you’re good to go! T-Rex chefs: you can add cubed ham/turkey if you’d like but my carnivore husband insists it’s awesome without – let your stomach be your guide! Feel free to whip up extra dressing so anyone that wants a little extra can drizzle it on their salad. I add an extra half cup of dressing the following day since the noodles soak up the goodness overnight. I think it’s safe to say that this salad is great the first day, and even better the next! Sometimes we even add a little Caesar dressing to the mix for a creamy pasta salad <— so good! 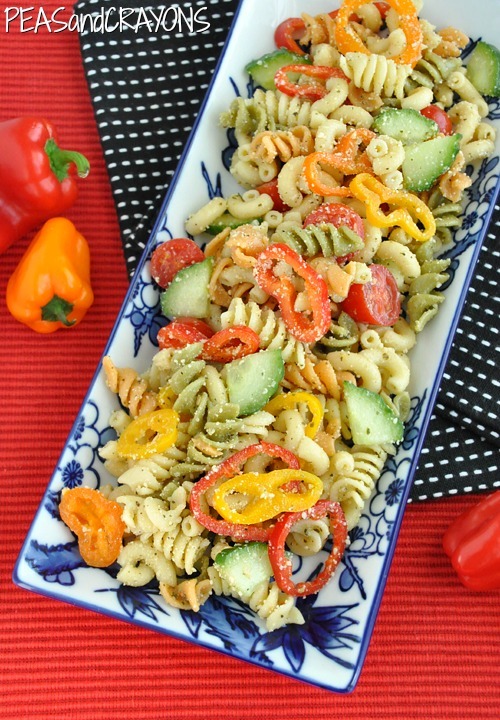 If you get a chance to try this confetti pasta salad, let me know! Leave some love in the comment form below or tag your photos with @peasandcrayons on Instagram so I can happy dance over your creation! I can’t wait to see what you whip up! I have a vegan friend and he loved this 🙂 thank you. I agree with you, pasta is awesome and so versatile. 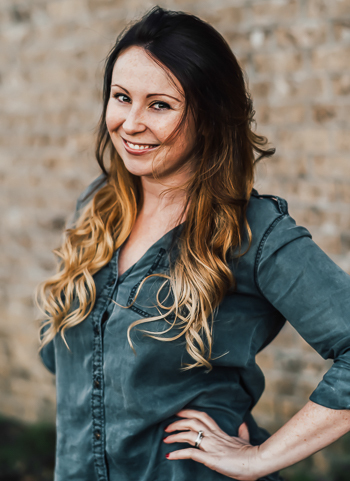 I just curated it on the On the Go sub-channel on Bliss.com. Thanks for submitting it. It’s a great recipe. Just made it and I love it! Thank you! I made this and OMG it was good, I added some calamata olives and instead of cheese, I used nutritional yeast to add that cheesy, nutty flavor. I will definitely be using this salad all summer long. I want to swim back strokes in a giant bowl of this stuff. YUUUUUUUUUUM!!! Thanks Krista!!!! Following you back! I will be making this so soon. I love the color but am really excited for the taste with all of the peppers. My husband and I will be living off of this stuff. YESSSSSSSSSSS WATERMELON! I have been counting the days until the “good stuff” is available! I want some right now! I’ll take some summer sunshine and good barbecue while we’re at it. Looks so delicious and colorful with all the veggies. That looks so tasty! I love that it actually is pretty darn healthy, too. I definitely will try this on my next burger night to make the meal a little healthier. Thanks for sharing! I think this looks incredible! I am TOTALLY adding it to my weekly meal planning options! I’ll let you know how it turns out! Where do you find that Ms Dash Italian seasoning at? Nearly ever grocery store I’ve visited has had it so I’d say your local go-to store should too! Walmart and Target sometimes carry it too but your best bet is probably one of the larger grocery stores in your area! It’s DELICIOUS! 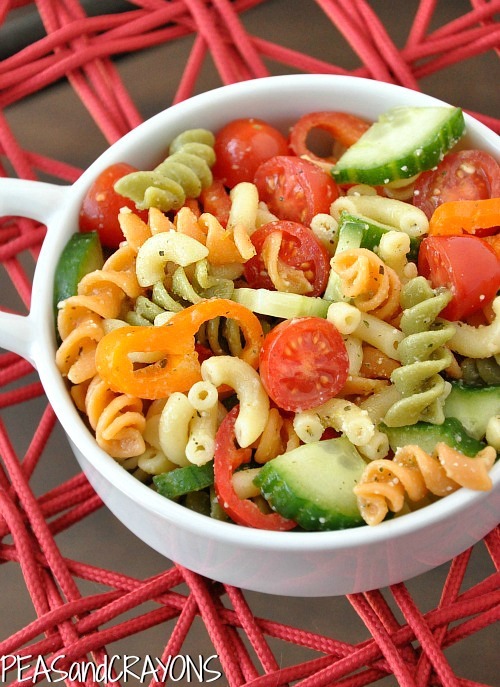 I’m with you… pasta salad any day! Yummmm! Jenn I love how colorful that is! It looks amazing! It looks very delicious and has me craving para salad at 0650! Thanks for the reminder of delicious easy yummy food. Yay, you posted the recipe! I saw this on your instagram, and love the colors! I’m such a color-oriented person, and seriously, I can’t stop staring. Those peppers/cucumbers/tomatoes are GORGEOUS when mixed! Oh my this does look amazing!! It has sleeted, snowed, reached 72 degrees, and poured cats and dogs here this past week…maybe I can make this and just pretend it’s spring?! 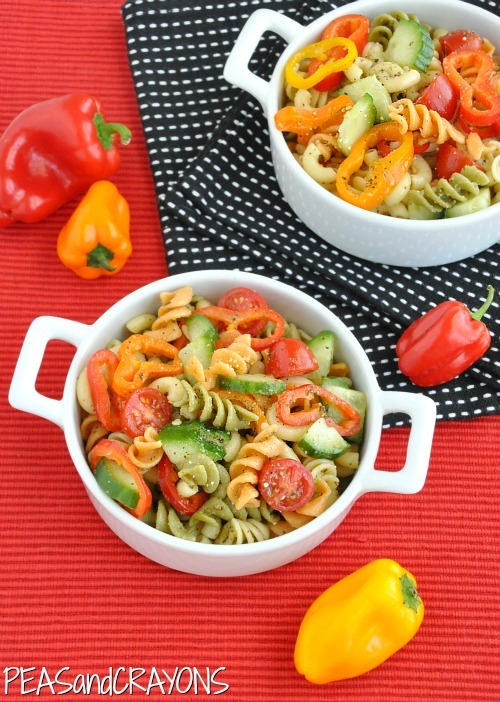 Seriously, pasta salad is entirely UNDERrated…and so are those baby sweet peppers! I (finally) found some organic ones at Publix the other day (when I was scootering my way up and down all the aisles looking for old people to run over…hey, Cat told me to! ;)) and proceeded to eat like half the bag once I got home! Your pics are gorgeous (as always) and are seriously making me crave summer! Oh, guess what! The man-friend is going to help me build a garden this year!! I’m so flippin’ excited…there is NOTHING like a fresh from the vine, juicy tomato!! Thanks schnookums! Gah all I want right now are garden-fresh heirlooms! YUMMMMM! Thanks Laura! These were greenhouse grown and sooooo ripe! I am dying for heirlooms to come into season so I can just eat them sliced and straight up! Yum! Omg, heirlooms are the best!! Plop a mega slice between two pieces of bread with some cheese and a bit of mayo (oh yeah, I said it) and I’m in Heavvvvvvvvvvven!! This looks soooo good. Can I just say I cannot WAIT until tomato season?! Spring, get here!! !